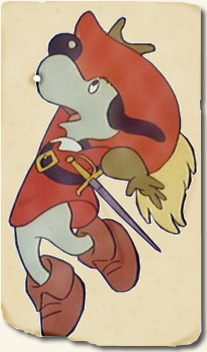 Dogtanian.net is unsurprisingly about the cartoon Dogtanian and the Three Muskehounds, the best cartoon about sword-fighting dogs to come out of Spain in the 1980s. You can find out about your favourite characters, re-live each episode, delve deeper into the world of Dogtanian. Or download the theme tune to use as your ringtone. I know that’s the real reason you’re here. Thanks to big Dogtanian fan Chris "Little Chris" Taylor for pointing out the screenshots were broken, they've been fixed now. Thanks to readers Adam and Дарья for informing me about the new 3D version of Dogtanian, due for release in 2016. I assume this is replacing the previously announced 2014 film. If you're reading this there's a 99% chance you just went on Twitter to make a joke about the live action remake of Dogtanian being crap, well done you. Thanks to dogtanian.net reader Adam for this link, BRB have announced a new feature length Dogtanian movie for 2014. Dogtanian.net is by Tom Phippen, here’s an RSS Feed to keep up to date, want to contact me just read this page. The site’s hosted by Pair and you can buy the Series 1 & Series 2 DVDs on Amazon giving me a few pence.